Kumasi, June 12, GNA - The Confederation of African Football (CAF) inspection team currently in the country to inspect sites and facilities in connection with Ghana's bid to host the 2008 competition on Saturday visited Kumasi to inspect the facilities in the "Garden City". The three-man inspection team led by Mr Patrick Okpomo of Nigeria, inspected the Kumasi Sports stadium, the Komfo Anokye Teaching Hospital (KATH), the Paa Joe stadium of the Kwame Nkrumah University of Science and Technology (KNUST) and the University hospital. Giving their comments after the inspection, the team said they felt satisfied with what they saw but asked that the Kumasi Stadium be brought to CAF standards. The team mentioned the provision of new dressing rooms, the expansion of the entrance to the field of play from the dressing rooms, the expansion of the press box as well as the provision of decent toilet facilities. 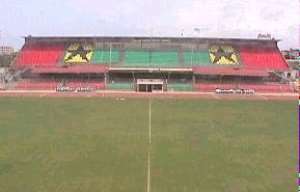 At the Paa Joe Stadium, where there are two fields to be used as training grounds, the team asked that the fields be re-grassed and the goal posts changed. The CAF inspection team is spending four days to inspect facilities at the Accra, Kumasi, Sekondi and Tamale stadiums, the proposed venues for the CAN 2008 should Ghana win the bid. From Kumasi the team will continue to Tamale and fly from there to Sekondi.